Police should not have shot and killed a 66-year-old emotionally disturbed Bronx woman who charged a sergeant with only a bat in her hands, Mayor Bill de Blasio said during a solo City Hall press conference Wednesday. CITY HALL — Police should not have shot and killed a 66-year-old emotionally disturbed Bronx woman who charged an NYPD sergeant with a baseball bat, Mayor Bill de Blasio said during a City Hall press conference Wednesday. "Deborah Danner should be alive right now. Period," de Blasio said. In an unusual move, the mayor sat alone at a table behind a microphone and answered questions about Danner's death for just over 48 minutes inside City Hall's Blue Room. NYPD Commissioner Jimmy O'Neill, who said earlier that officers had "failed," did not attend. The mayor, appearing emotional as he spoke about Danner and her family, was unequivocal in his stance that police should not have shot and killed her. "We did fail and we need to say it out loud," said de Blasio. Police responded to Danner's apartment on Pugsley Avenue near Randall Avenue in Castle Hill at 6:06 p.m. Tuesday after a neighbor complained that she was acting "in an irrational manner." Sgt. Hugh Barry and other officers entered Danner's seventh-floor apartment where she threatened police with a pair of scissors she was clasping. Barry was initially able to calm Danner down and get her to put the scissors down. But as he escorted the nightgown clad Danner out of the apartment she grabbed a baseball bat, ignored orders to drop it and charged Barry, police sources said. Barry fired two shots from his service revolver which struck Danner in the torso. De Blasio said Barry had failed to follow police protocol when dealing with emotionally disturbed individuals. He did not wait for the Emergency Services Unit, which is specially trained to deal with emotionally disturbed individuals, to arrive. "I was very disturbed when I heard the details because this didn't have to happen," de Blasio said. De Blasio also confirmed that Barry had undergone the departmental-wide retraining that occurred after the chokehold death of Staten Island father Eric Garner. Portions of that training focus on de-escalation of incidents. "It's quite clear that our officers are supposed to use deadly force only when faced with a dire situation. And it's very hard for any of us to see that that standard was met here," said the mayor. Barry has been stripped of his badge and gun. Police had been called to Danner's residence a "handful" of times over the last few years, perhaps up to four times, said de Blasio. Danner's sister Jennifer had legal guardianship of her, said the mayor. Danner's battle against mental illness began after college and Jennifer Danner had been trying to help her sister for decades, de Blasio said he learned during a conversation with the woman. "She had spent decades trying to help her sister. She told me that Deborah's mental health problems had emerged during college and that literally for all those decades since Jennifer had tried to help her sister in a very, very difficult situation," the mayor said. Jennifer Danner was in the hallway waiting to accompany her sister to the hospital when the shooting occurred. "She said she was standing there in that hallway ready to go to the hospital to meet the doctors to see what they could do. And she told me she did not in any way expect to hear gunshots ring out," said de Blasio. But they did and there's no excuse for it, the mayor said over and over again. "The shooting of Deborah Danner is tragic and it is unacceptable. It should have never happened. It's a simple as that — it should never have happened," de Blasio said. Police reform groups said the mayor's remorse was not enough. “While acknowledgement of failure is an important step, whether this administration is serious about changing more than just rhetoric will be measured by whether disciplinary action is swift, meaningful and comprehensive,' said Monifa Bandele, a spokeswoman for Communities United for Police Reform. "Danner’s killing is yet another tragic example that training and changed rhetoric are no solution to the police violence that is killing and brutalizing Black and Latino people across this nation, of which New York is by no means unblemished, when accountability is absent," she added. The City Council's Black Latino and Asian Caucus called on Attorney General Eric Schneiderman to investigate "this latest case of a civilian losing her life at the hands of the NYPD." Schneiderman spokeswoman Amy Spitalnick said the office is reviewing the shooting "to determine whether or not it falls within the Attorney General's jurisdiction." Gov. Andrew Cuomo issued an executive order last year that authorized Schneiderman to investigate cases where police killed unarmed civilians and cases where "there is a significant question as to whether the civilian was armed and dangerous at the time of his or her death." Danner reportedly had a scissors and a bat during Tuesday's incident. The Rev. Al Sharpton called the shooting "atrocious" and compared it to the 1984 fatal police shooting of 66-year-old Eleanor Bumpurs, another emotionally disturbed black woman from The Bronx who allegedly lunged at police with a knife during an eviction attempt. Bumpurs was shot twice and killed by an officer wielding a shotgun. De Blasio recognized the comparison to Bumpurs' case but repeatedly framed Danner's death as an "individual decision" by the sergeant involved because of the police training that has taken place since 1984 and since he took office. The mayor said police had responded to more than 128,000 calls involving an emotionally disturbed person so far this year and none were killed. 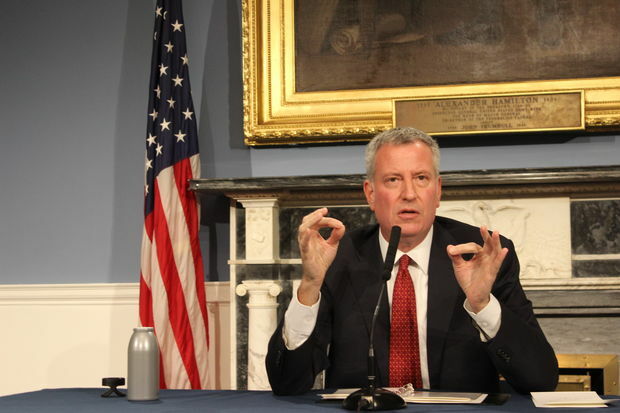 "The fact is the department made a lot of changes after Eleanor Bumpurs and we're going to continue to look at how to do things better," said de Blasio. "But one thing that is very different is that the kind of protocols that are in place now did would exist back then. If the protocols had been followed (Danner) would be alive. It's as simple as that," he added. Sergeants Benevolent Association President Ed Mullins said the police commissioner and the mayor were denying Barry his rights to due process by announcing that police had failed before an investigation was complete. "We are questioning why he didn't use the Taser? Do we realize no one has interviewed the sergeant to ask why," said Mullins. "The mayor is looking to pander to a political audience. If you see failure then that means your policies don't work."